Nice one, Poacher. Yep looks like all that made the pub last year are in. Great to see you running again. Leslie, glad the knee is a bit better. Is it worth seeing a podiatrist to properly look at your foot strike and gait etc? Great 5k, OO. That's faster than what I could probably do mile intervals at. Nice progressive, Gerard. I see Jersey has been the host to some misbehaving sports stars!! The strava segments where I was were all fair and sensible to be fair. There was another decent runner there and so where it gives segment leader boards for the day, we would often alternate between 1 and 2. Nice easy 7, Gul. I do agree with other comments that a couple of good half's will set you up well. With the miles you do, you should then convert well. I do also see the point that going for broke and a sub 3 might be less appealing than simply trying to get under 3.15 and pacing for that. Nice session, Stevie. Happy birthday. Yes whatever happens you will smash your pb. I did Stratford parkrun last August and it was a bit of a breakthrough for me in that I took 33 seconds off my 13 month old pb. I think if you were to run a 10k at sub 38 pace you would need to be posting a very low 18 at parkrun this week. Just bodypump last night. We had been up since 4am travelling so it was better than nothing. 12 mile mlr planned tonight. Getting into London has given me some food for thought. We are going to be in Edinburgh by looks when the mara is on. I don't really want to dominate unduly a family weekend with mara stuff. However, even if I did it easy and enjoyed it, it seems a shame not to take the opportunity. Congrats everyone on the GFA places. Very jealous! Determined to make sure I am definitely in for 2020. Gul - Have a great weekend in France, an easy weekend will do you good. OO - Fantastic PB and excellent pacing! I think my coach did the same race as you, he won with a course record of 14.34! DT - Indeed, what a moron, apparently he punched a female cop and then tried to run off whilst handcuffed. He's not the brightest and almost ruined his sports career once already. Your holiday Strava battle sounds fun. OO - As said elsewhere your 5k time is very impressive. You are having an unbelievable run of form. Gul - Enjoy France, love going there for short visits. Stevie - Nicely done on the half entry, I was hoping to do the Jersey one in September as a warm up for the mara but I am flying off Island now so no half marathon for me this year. 5k tempo lunch run today 6:37 avg. Wind and rain, not pleasant. I think summer came a month early and now autumn has arrived a month early too. It's been awful since I have come back from Holland. Much prefer living/running in the warmth and sunshine, think I need to emigrate! And best Birthday wishes old bean! I was looking at his website. What I find slightly odd is that he lists his racing expertise as very much track and up to 5k. Yet he advertises his coaching expertise as 5k to marathon. 13.1 miles tonight at 7.45mm for 142 bpm. Conditions were good and what a difference it makes. That and largely fresh legs made it feel utterly effortless. 0054 another cracking race you are on a roll and if you couldn't get a Gfa none of us have a hope ! Dt sounds like you have talked yourself into an easy mara already. I had footstrike and gate analysis 2 years ago or so when I had my knee op ,got some insoles to correct overpronation which I didn't really like but wore for a good while , didn't really help and seemed to be causing other issues. I have very tight quads and I think this is pulling on my kneecap causing pain. Right knee clicks a fair bit too so not working 100% .Will work the quads ,right one has always been considerably smaller due to knee issue so need to try to correct that too if possible. Probably too many fast miles for my low volume making things worse. Stevie how young are you ? , a lot younger than some of us old coffin dodgers I bet lol sub 18 is a cracking target . Gul enjoy France and just crank out a mara on your own some time after you get back when things are just right if no races suit you. 2 x 10 mile at mara accidentally could be seen as sandbagging ..just sayin' !!!!!!! Gerard definitely an autumn feel in the air already ,bring back summer ! and a decent 5k effort there . Not ran since last Friday but knew the club had a 40 min tempo and was too tempted to resist but I wouldn't make it back for work so went on my own tempo 20 mins early and met them when I was coming back in to come confused looks . 5.3m at 7:34 pace was the result ,fair enough for a 4th nightshift. Of course it didn't help my knee one bit but then I knew that will rest tomorrow as I would only be fit for a snails pace anyway, think 1 session a week would do me for the meantime . Leslie I can't offer much help- knees and calves have never given me issues. However mechanical problems like that are hard to fix. Would gym work help- build up those weaker muscles perhaps? I had a rest day yesterday. Easy 10 planned today. Hope the issues get sorted Leslie. Look online for some dynamic stretches, maybe? Doing basic squats when I can seems to be helping my glute issues on this campaign. 6 miles at 6.48 pace last night. Was going to be slower as had two solid days previously. However, the final two miles felt good so just went with it, chucking in a 6.24 final mile. En route to Wilmslow with work today, so a nice rest on the train whilst contemplating an early start LSR on the trails tomorrow with some chums that are better at early mornings than me. I was 29 yesterday Leslie, thanks for the birthday wishes everyone! Hope the knee starts healing Leslie. DT yes his experience is very much up to 5k. However his coach mentors marathoners and he has learned from him and I guess the coaching courses. His methods seem to be working for me so I'm happy so far! Poacher - great to hear you've got your GFA place. DT19 - welcome back - solid MLR. Stevie - maybe see you at VLM in 2020, when you'll be the ripe old age of 30! GM - good tempo run. I think the dry calm weather will be back before you know it, but maybe not quite so warm. Leslie - glad the knee held up, but take care. 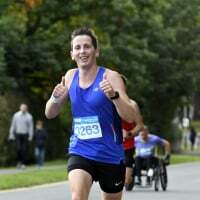 I did a solo marathon in training last year just to prove to myself that I could do sub 3:15 and got a 16 min PB, but a flat out effort before the Rother Valley mara might not be a good idea. Maybe in December. GD - good 6 miler. Early start LSR? Go for it! 15 miles this morning - first 7 averaged 7:55/m and last 8 avg of 6:53, but it was mostly a progressive run. So that finishes the week for me on 47. Stevie, yes, it definitely seems to suit you. Poacher, I have been getting knee pain recently. Then I looked back on garmin and realised i'd done over 500 miles in my current trainers, which is likely to be the reason. New pair ordered today. Good solo tempo. Just planning a recovery 5 today then i'm hoping I can get up for a parkrun tomorrow. I've not slept well since holiday and waking up knackered and if I do that tomorrow the last thing I will fancy is a parkrun at any effort level. It just throws up the fact that this runner will be just a decent club/county level female really and will probably not even think that rules about what you can have in your body really apply to her and she certainly wont have the wealth of medical advice to know what she can and cant take like an elite would. OO – Awesome 5k PB – that a full 30 seconds better than me. So you should be 10 seconds a mile faster at all distances. My Marathon PB is 2:48:36 – you can do the maths…. Poacher, OO– Well done on the GFAs! Leslie – Sorry to read your knee problems continue but a good 5.3 miles done. I’d recommended weekly hill sprints to protect from injury – 10 second sprint up, walk back down and repeat 10 times. DT – Nice HM easy effort. Only 500 miles and your changing your trainers? I’ve never retired a pair under 2000 miles and planning over 3000 in my current Hokas. I was feeling shattered on Wednesday and didn’t think my interval session on Thursday was going to go well. However, I’m very pleased with my fastest intervals of the year. I ran 13.1 miles including 6 x 1 mi at 5:56 m/m average. That’s 21 seconds a mile faster than 2 weeks ago, so show’s how I progress with high mileage training. Nice intervals and podium topping, Badbark. I've never listened to marathon talk and wouldn't know where to find it. Is it general running chat or literally 'marathon' chat? I cant comprehend that mileage in a pair of trainers. I usually change at 400-500 miles as my knees and shins begin to suffer. It's slightly annoying as particularly in summer they still look pretty new. Marathon Talk is a good podcast DT19 which I used to listen to while traveling with work. Needless to say I have mssed the last few. Great to hear your sesh went well Badbark you really are flying. https://marathontalk.com/ I've listened to all 449 episodes learning lots over the years. I only retire a shoe when they fall apart - I've only ever bought about a dozen pairs of shoes in 9 years and I still use most of them. I've run about 25k miles. My knees start to hurt when shoes get to 500-600 miles. Only had two pairs split on me including the Salomon Speedcross 4s but they took a hell of a beating off-road. The chaps suggested an early start this morning. I hate that but I knew it would be worth it. I beat the alarm and headed out for 3 warm-up miles at 06.35 before meeting them at the rendezvous point. We hit the trails, filthy jokes and insulting banter carried us around. It was slower than all my recent LSRs which was absolutely ideal. The vast majority of my runs have been alone so it was nice to have some company. The morning delivered 18 miles at 8.30 pace, perfect and just what I needed, dead easy as demonstrated by the average HR which was only 136. Only needed one gel and legs felt fresh. Good signs and one of my favourite runs of the year. Sounds like a lovely run G-Dawg. Nice pacey miles at the end too. Rest day yesterday and hit the parkrun course this morning. Good conditions and finished in 19:02. Felt good today and planning on 22 tomorrow. Must get some gels and the forecast is looking ok, so kinda looking forward to it. Have a good weekend all! I managed to drag myself along this morning. really didn't fancy it when I woke at 7.40 however I knew that my alternative was going out an hour later on my own and doing 3 miles at short tempo pace. I decided on an effort of between 10k and 5k. My schedules pace was 6.05 and that was about right. That also meant I could just dip under 19. Miles 1 and 2 came in 6.05 and I felt comfortable ( working but with a gear to spare) and I was sat in joint 4th. The guy with me seemed beat so I just planned to secure 4th in last 400m. Suddenly from nowhere my stomach went and had to stop briefly with 800 to go. Then again with 400 to go. Consequently mile 3 was 6.24. I then ran the final 0.1 in 4.48 pace to try to redeem myself as stomach settled. Finished 5th in 19.07. Pleased with how relatively easy/controlled 6.05 pace felt but annoyed that stomach issues ruined an otherwise enjoyable and solid run. Still, decent workout. 20 planned tomorrow will give 51 for week which isn't bad given I was on holiday until Wednesday. Quick check in. 18.09 at Stratford Parkrun this morning. Which is a 1.26 PB. Went 5.51, 5.51, 5.52 then sprint finish. Chuffed with the pacing and the time! 9th place so the standard was high today! Oh dear DT it's a bugger when that happens. I try to eat early on a Saturday Eve. Excellent run Stevie and congrats on the massive PB! I managed 18:45 at parkrun. Very tired after last few days so happy with that and managed to stay under 6 Min miles. 16 planned tomorrow for a 55 mile week. Great stuff, Stevie. Be interesting to see how far you can take things given how quickly you've improved. I perhaps might be better off doing a parkrun further away. I was sat in bed at 8am with tea and toast. Though as I was only planning a reduced effort I didn't think it would be an issue. Badbark 2k a shoe is getting your monies worth but you run on grass a lot too don't you? DT try with no brekkie and see what happens next time. Stevie not bad for a youngun I suppose.....You totally smashed it well done ! 0054 sub 19 is still excellent. 4m yesterday with 3 hill sprints at the end which are kinda fun to do ! Funny how hill sprints can be fun, Leslie. Glad you enjoyed them. Just 4 recovery miles for me today with a few strides in the last mile which brought the average down to 7.12 pace. I think I mentioned before that my recoveries are quicker than the textbooks state but I just start at easy pace and seem to get quicker as the Legs loosen. A few strides only in the final mile seems to shake out the legs nicely and prep me for the next week of training. Stevie - That's a brilliant parkrun! Looking very good for your 10k. DT - Shame about the tummy issues but you seemed to rally well. Do you normally eat before parkrun? I just have a coffee and a banana afterwards followed by more coffee. OO - Still a very good parkrun after your race. G-Dawg - Ticking over nicejt and similar weekly total to me. Leslie - Is the knee a bit better? LSR done this morning. I specifically chose a very hilly route as I'm not great on the hills. 22 miles with over 1,000ft of elevation. Pace was easy but felt tired by mile 8, not ideal with 14 still to go. Ground out the run avg just over 8mm with a few faster miles from 17-22. Can't say I enjoyed it but glad I got it done. Won't be able to do much running next week and am away the following week so not much time left for LSR's. Might get another 20 in before race day if things pan out well. running took a backseat here (and apologies for not reading back) - my friend was lucky to escape alive from a fire at her apartment, so been a bit preoccupied. Eked out 32 miles. Birch - OMG! Is your friend ok? Gerard, nice 22. yes I do tend to have some toast. perhaps I'll try without. Sounds frightening, Birch. hope they are ok.
Leslie, nice little run. I don't ever do hill sprints. should throw a few in perhaps. 20 for me today for 51 for week. pleased with that given I was on holiday until Wednesday. 20 wasn't brilliant as legs felt heavy and my nutrition yesterday was poor. just ticked along for 8.17 average. That's 3 x 20 and 1 x 21 completed so with 8 weeks to go I'm well placed. Fairly heavy 10 days coming up before I have a mini taper for Wolverhampton half 2 weeks today. Sorry to hear that Birch. 17 here and 56 for the week.